A few people braved the roads this weekend to come to their camps in Leetonia. 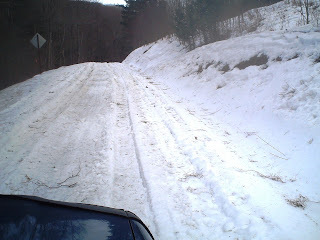 This is what the road looked like today past our house on the way to Leetonia. It has melted more and refroze making it a bit easier to get over. The bad news is there is another 8 inches of snow coming tonight. After being spoiled with this early meltdown and warm weather last week..this is not welcome news. Of course the weather people have been wrong so I will know in the morning if I can make it out to work. I do prefer the snow over the freezing rain they had talked about earlier so you all have a good week. Mountain girl, Paula, logging out. 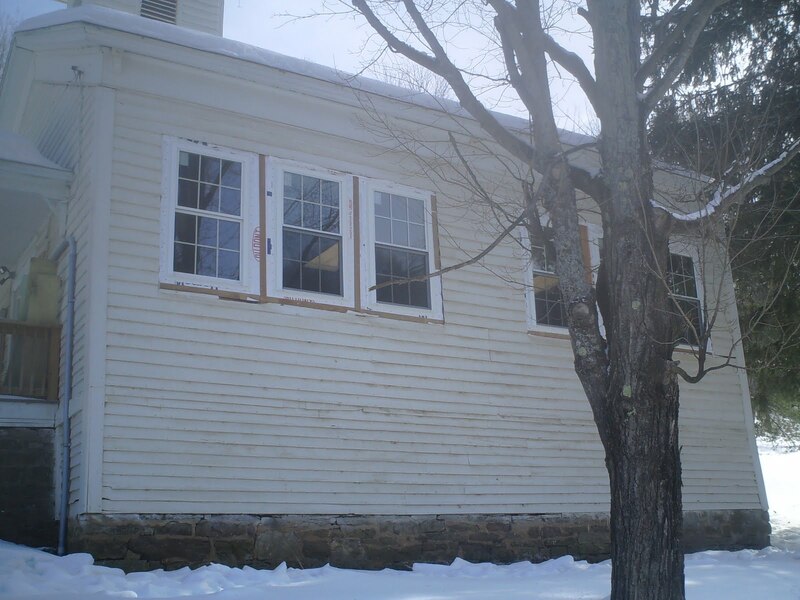 Just thought I would post some progress pictures on Maynard School house project. 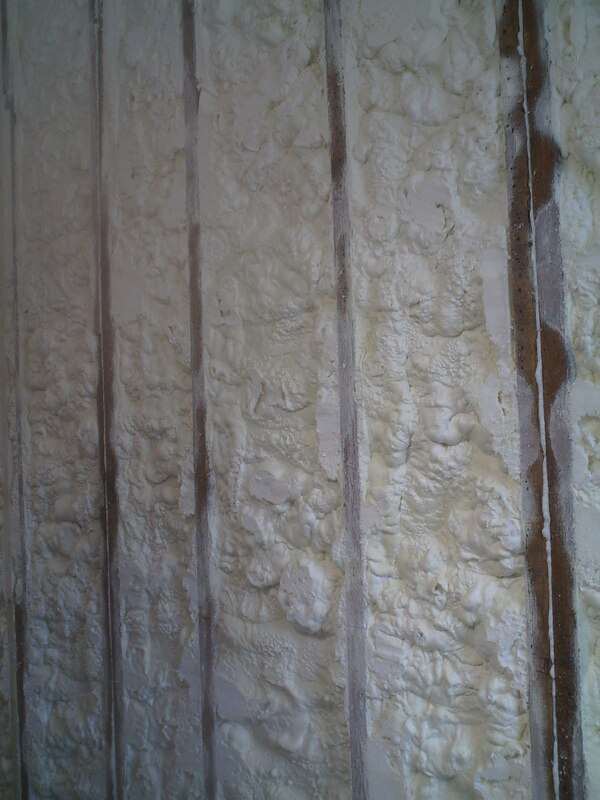 I had a company come in that sprays expanding foam insulation in. You can see how tightly it filled the walls and cracks. Even without insulation in ceiling and floor there is a significant difference in the building. 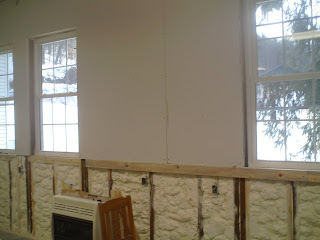 I fir stipped the walls as they didn't have even spaced or sized studs trying to get the wall as flat as possible. This also allows me to put the board in vertically and have tapered seams which mud much nicer. 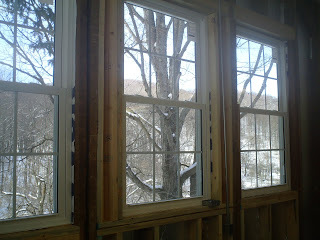 The lower part of the wall is going to get vertical pine with a sill running at the height of the bottom of the windows completely around the room. Just above the tops of the windows will be a drop ceiling, which will allow me to put a level ceiling in to match windows. However, there is not much that can be done with the floor that slopes off as much as two inches to one side. 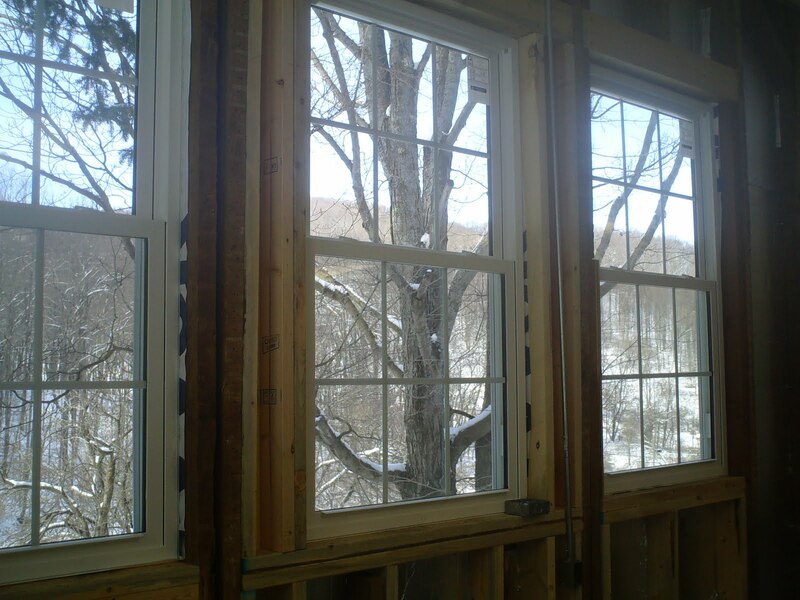 Leveling that isn't in the budget so we will have to settle for level windows and ceiling. In the area of the old chalk board the pine will be lower to allow an area to place the board back up. We did some major retying of the roof rafters and ended up doing some repair on two broken ones. One had broken completely in two. I have some more holes to varmint proof in the attic before I put in the insulation, which will be 12" blown in cellouse. The weather warmed up so much today, I worked without a coat all day and felt hot. The roads started melting and made for a slushy slide home. Roads with significant snow on them in unplowed areas are basically impassable until the weather freezes or they melt a lot more. There is as much as 12" of slushy snow on some roads. Other roads in the sunny areas may be down to the bare dirt. It can be easy to start up a road that looks good only to find yourself in a bad situation fast. So be careful if you are coming up. The tow guys charge a pretty penny to come back if you can find one that will. On a sadder note, Bravo Button's wife Helen passed away from her battle with cancer. Helen was the election judge for our township and spent many a day in the school house I am working on counting ballets. Sadly, she won't be around to enjoy a much warmer and nicer building to work in. Our sympathies go out to Bravo and his family. Mountain girl, Paula, logging out. The windows are in the Maynard school and it makes a huge difference. I am able to get the room up to a temperature I can work without gloves. The rough electric is just about done and the walls have been covered with a half inch foil covered foam board in preparation for the the expanding foam insulation to be sprayed on next Tuesday. The reason we put the board up was to keep the insulation from sticking to siding as there is siding we need to replace soon and in the future. Once the insulation in the walls and ceiling is done working inside the school will be so much easier as I won't have to wear snowpants to do it. Bending and moving in general with many layers of clothes on is difficult. The outside work will be waiting until the snow and ice is gone at this point. Moving the ladders around in the ice covered snow was a bit more than difficult. Thursday on the way to the lumber yard I saw a calf, which had been born laying in the field. Normally this would be fine but it was -4 and the calf was freezing to the ground. I stopped at the farmhouse to tell them, but no one was home. So I went to their neighbors and had them call owners. I continued onto the lumber yard, but the sight of that calf struggling and freezing stuck in my brain. move. I kept an eye on the mother as I struggled to lift the limp 80lb calf. I half lifted and half dragged the calf about 300feet through the snow with its mother watching me. I got to the truck and shoved the limp calf up next to Scooter. He wasn't impressed. The wierd creature made him nervous at first, but then he started to lick it. I don't know if he was being kind or wanted to taste it. I drove to a friends down the road with a barn hoping they would have somewhere warm for the calf. They didn't have anywhere so I told them I was taking it to the school house until the owners showed up. They called the Browns and let them know where I took the calf. I keep the calf in my truck with the heat running full blast until I could get the school house warmed up a bit. Then I brought the calf inside and set him on some insulation board by the heater. The calf was so weak and cold it wasn't able to lift its head. The owner arrived shortly after and retrieved the calf. I hope the little guy did okay, but it didn't look good. So I spent the rest of my day working and smelling like newborn calf. Never a dull moment in the middle of nowhere. Mountain girl, Paula, logging out. We got another 4-6 inches of snow yesterday and it is started to be hard to push it anywhere. The last snow was very wet and froze into a solid mass on the edges of my drive. Hitting it is like hitting a wall. The trees did look pretty this morning with a fresh coating of snow and it seems very quiet after a snow. The wind brought lower temps for today. I woke up to -5 outside and 53 degrees inside. On mornings like this the first priority is getting the heat going. I got the new windows in at the school and am hoping this will let me heat the place above freezing so I can work a little easier glove free. The electric conduit needs to be complete by next Tuesday when they spray the expanding foam insulation. 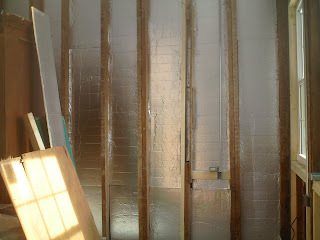 After the place is insulated heating it will be much easier. The dogs are cuddled up as close to the fire as possible and I am feeling a bit envious this morning. The thought of working all day in this cold is not pleasing. A gas well worker was killed in a vehicle accident at the jobsite last week. Reminding me to be very careful on these slippery roads. The loggers take their big rigs up in the woods all winter and I marvel at their courage to take large trucks into place most of us wouldn't take much less than a snowmobile. The work around here in the woods and gas lines is very dangerous and my hat goes off to those workers willing to risk it all for a paycheck. Mountain girl, Paula, logging out. This is the time of year when I get tired of winter. 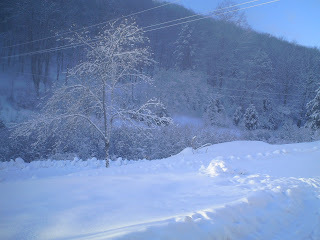 It is unfortunate because we have at least 2 more months of bad weather to go. 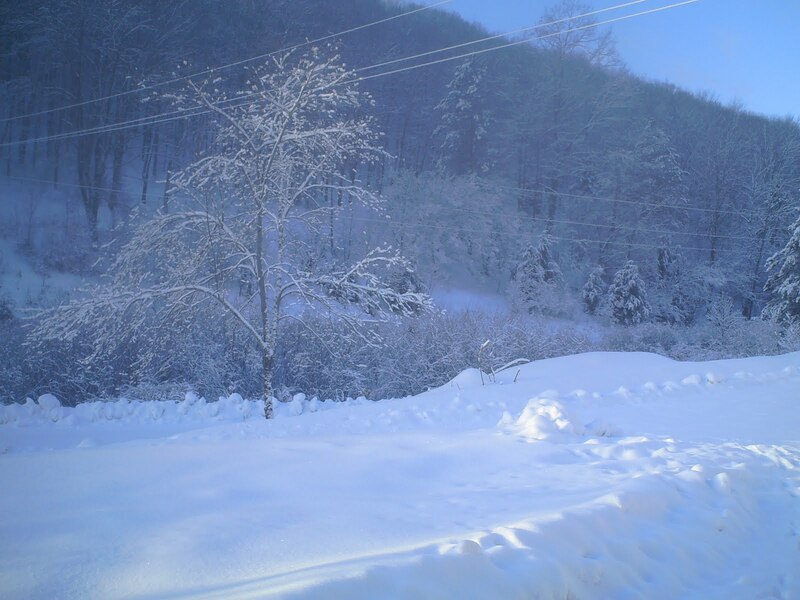 We have gotten several small snows over the last few weeks the largest one being around 6". In between snow we got freezing rain which has left a hard crust on top of the snow. Speck, the chihuahua, is loving being able to walk on top the snow without sinking. The rest of the dogs and I are intermittent with staying on top. It is not a pleasant surprise to be walking on top and then suddenly drop through the crust. This often is followed by the rest of me knelling in the snow. The deer aren't fairing any better. Their sharp hooves let their bodies drop through and make them slow moving targets for predators or worse give them a broken leg. One such deer is laying in the middle of the road about a mile up from me. The deer is mostly eaten by predators and is providing a mid-winter feast to a few crows. I watched other deer who get in the road happy to run somewhere with no snow, but as soon as they jump off the road they are belly deep in snow and struggle to move. I am slowly working on the school house in the cold weather. The outhouse isn't nearly as fun to use when you have multilayers of clothes to remove. Stepping off a foot high snow pile into the outhouse yesterday, caused me to misjudge my height as I entered it yesterday knocking myself in the head on the top frame of the door. As I trudge to it knee deep in snow I often think about the kids going to school here long ago doing the same thing and feel much empathy towards them. I had two days I couldn't work this week one due to weather and one due to a dentist appointment and a broken snowmobile tow for someone. So I am making it up this weekend. Thinking of stopping into the snowmobile club for breakfast tomorrow morning before I work. All you can eat sounds good before a day in the cold. All I can say is the groundhog best be right and Spring is early...cause I am ready. Mountain girl, Paula, logging out.